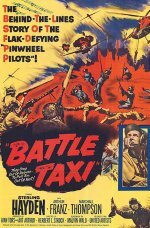 In this Korean War drama, Sterling Hayden plays the commander of a unit of rescue helicopters who's getting grief from Arthur Franz, a former jet pilot who resents his present assignment and starts launching attacks in his unarmed chopper. The picture mostly comprises shots of helicopters and stock footage from the real war, glued together by director Herbert L Strock - the man who made the gobsmacking Gog and the seminal I Was a Teenage Frankenstein. A hot-shot pilot must put his ego to one side and learn how to operate as part of a team when he joins the helicopter Air Rescue unit. Korean War drama, starring Sterling Hayden, Arthur Franz, Marshall Thompson and Leo Needham. Copyright Vic's Rare Films 2004 - 2018. All dvds are guaranteed to work in the UK and Europe, Australia and other PAL format regions. Outside these regions we advise you check your equipment. All orders are supplied with full artwork and covered by our 30 day guarantee.